Now that it’s starting to get a little bit brighter and lighter (although not much warmer yet! 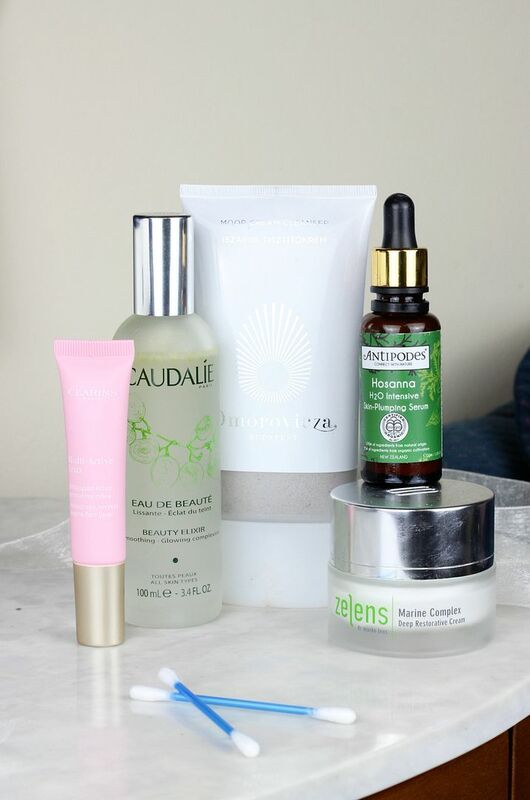 ), I wanted to check in with all things regarding my current morning skincare routine – it’s quick, it’s easy and means I can put my makeup on speedily and know that my skin will be nicely hydrated all day. My cleanser of choice for the morning right now is the Omorovicza Moor Cream Cleanser (which I wrote about here as well), which is so lovely. I normally apply to dry skin before hopping in the shower and then rinse it off using a flannel. I really like cream cleansers in the morning because they clean the skin without stripping, and this particular one from Omorovicza is gorgeous in the morning because it doesn’t leave skin feeling heavy at all but just leaves everything feeling balanced and prepped for the day. After cleansing, I sit down at my dressing table and use five-six spritzes of Caudalie’s Beauty Elixir. It does an excellent job at perking the skin up early in the morning, and it smells divine. I wrote all about it here but know that it’s a bit of a morning essential. Under my eyes, to help wake me up in the morning I use the Clarins Multi-Active Eyes (which I wrote about here). For serum, I love the Antipodes Hosanna serum, which does a lovely job at plumping the skin and making sure everything is hydrated. On my second bottle of the stuff, it’s dreamy. My moisturiser of the moment is the newly launched Zelens Marine Complex Deep Restorative Cream. I am feeling oh so fancy using this cream every morning, like a real grown up; it’s sitting very proudly on my dressing table. I had the pleasure of meeting Dr Lens where he talked through the launch of this – it has been designed as a regenerative and cosseting cream to soothe the skin and as such is a dream come true for sensitive skin types. I’m still testing it out (skincare takes a long time to notice a difference), but my early thoughts are that is pretty perfect for me. It’s rich but it sinks in really well on my skin and leaves my skin supple + hydrated all day.